We spent many years experiencing and researching coffee machines. We finally came across a machine that is well engineered, well designed and has a full South African repair and back-up service. The Swiss made Jura products ticked every box. This machine is the perfect choice for any small to medium environment, home, office or accommodation establishment who serves between 5 and 20 cups of coffee per day. Whether you are running a hair salon or vehicle show room, enhance your customer service and professional appeal with this professional machine. Not only does it work well but it looks good to! Spoil the whole family and enjoy restaurant quality coffee at home. 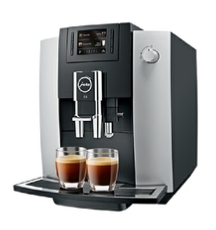 Jura are one of the most reputable coffee machine manufacturers in the world! FREE: With your order you will receive 4 kg of our freshly roasted speciality coffee along with a free Jura glass milk container, together valued at approximately R1000!